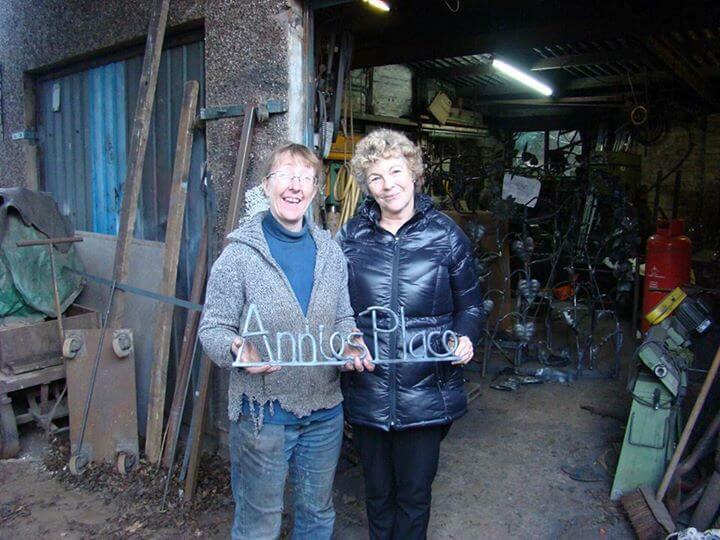 With our first season now on the Orkney horizon, Annie’s Place is all geared up for the 2015 guests to arrive. First guests, however, check into Birsay Bay: they are not humans, but birds……this week, the fulmars are gliding past our bench at the sea wall, while the first white swans have touched down in the bay, where they spend the Spring season dibbling around in calm waters just beyond the Boardhouse River delta. Last year we had 38 swans in all: in summer, most will go inland to nest in Twatt and Stenness. Last year an intrepid swan nested just five yards away from the roadside at the Ness of Brodgar, as thousands of tourist passed by. Meanwhile at Annie’s Place Robin and Anne have been preening their feathers and sprucing up for our own welcome guests. Sea-fresh colour tones in the hall, kitchen and bedrooms, to set off Rosanne’s Orkney landscape paintings, new lighting throughout, including diode feature lights in the sitting room, a brand new halogen oven/hob in the kitchen, total control heating serviced by local electricians and replacing the former plumbing unit with a fresh new water reservoir in the loft. On Thursday, the Visit Scotland inspection gave us excellent feed-back, endorsing all we have done to make Annie’s Place a good holiday venue in Orkney. Apart from the comforts and convenience of the apartment, the proximity to the sea, historic sites and village shop were highlighted as real positives for our guests. For visitors who want to get out beyond the adjacent coastal walks, our two adult bicycles have been checked over professionally by Orkney Cycles (we don’t take chances with our guests on holiday). So get on your bikes, folks. 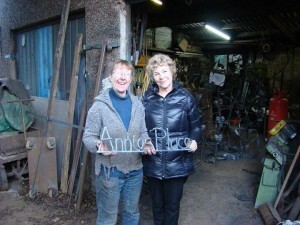 To set the seal on your new home from home, we have commissioned wrought iron nameplates for both The Old Manse and Annie’s Place from Scottish smithy, Elspeth Bennie, seen here with Anne at Ironhorse Studios, Balfron.